?Cover it with blood of its mother? The egg has currently no use, that’s still being worked on! There are currently 6 fully working special attacks. They get triggered only if the difficulty is medium or hard! Divebomb: The dragon goes really high, slows down and then swoops vertically through the ground, destroying large chunks of land. Then he attacks a player from below. Stay’n’fire: The dragon almost stops in the air and repeatedly shoots fireballs at a player, while following him at very slow speed, high in the air. Amount of fireballs and shooting speed depends of difficulty. You can hide to stop the attack slightly sooner. Bitemadness: Quick melee attack, when the dragon starts biting you, potentionally causing poison, blindness or nausea, which makes it harder to orientate, run away and hit the dragon. You can deal him damage to make him stop biting and fall back. Punch (skullbash): In the first phase, the dragon’s keeping his distance from the victim. Then he flies straight at him, almost 5 times faster than usual, dealing a great amount of velocity to entities he hits. Freezeballs: Only a half-attack. Starts with shooting freezeballs at a player to slow him down, while he quickly prepares for next attack that the slowed down player can’t avoid. 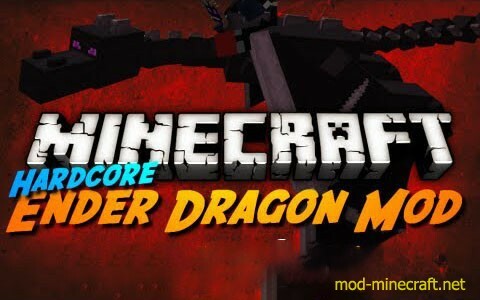 Summon: Similar attack to Stay’n’fire, except the dragon goes even higher so arrows can’t reach him, and instead fireballs, he spawns angry endermen around a player.